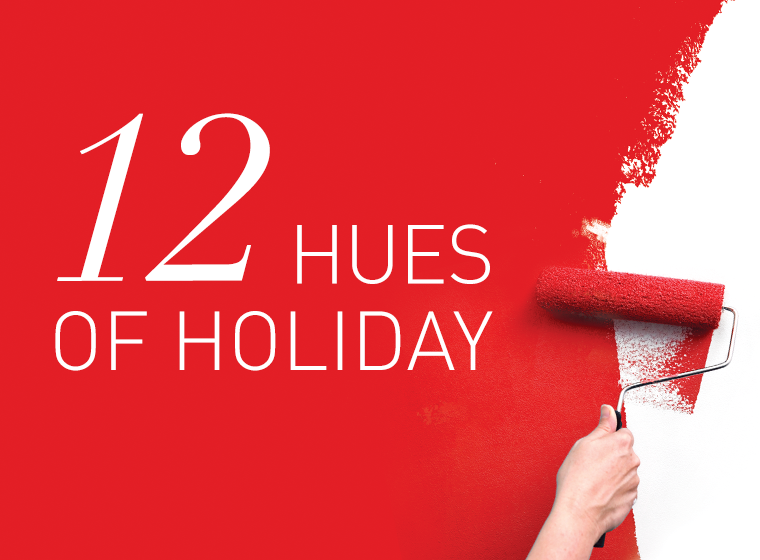 WOW 1 DAY PAINTING presents the 12 Hues of Holiday: all of our favorite colors of the season in one place. These colors are inspired by nature, holiday traditions and tasty treats. Get inspired by classic traditions and fresh new ideas to create your own magical holiday home looks! 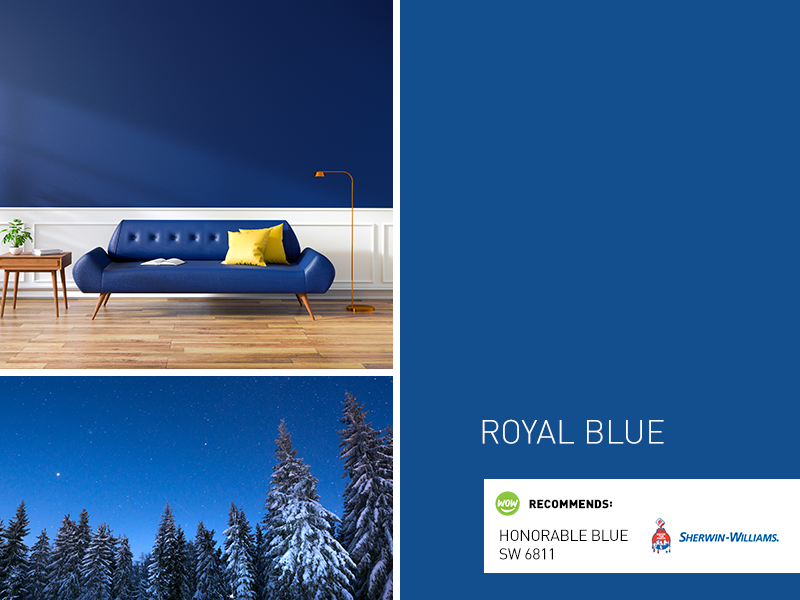 Royal blue is the perfect color to kick off the holiday season. As we get closer to winter, the days are getting shorter and we’re spending a lot more time indoors. This color is inspired by the richness of the sky at dusk. When you see this deep hue appear, you might think of the cool, crisp air outside, or the ink from the pen you use to address all those holiday cards. Deep browns bring a warm, cozy feeling to any interior and can enhance the natural vibe of a room. This color reminds us of the sweet smell of pecan pie that fills the senses, even after we’re full from Thanksgiving turkey. And honestly, is there anything better than finishing the day by cozying up with a fresh slice of pecan pie surrounded by family? While it may not seem like a classic holiday color, bold black accent pieces can add a dramatic flair to your holiday table setting. 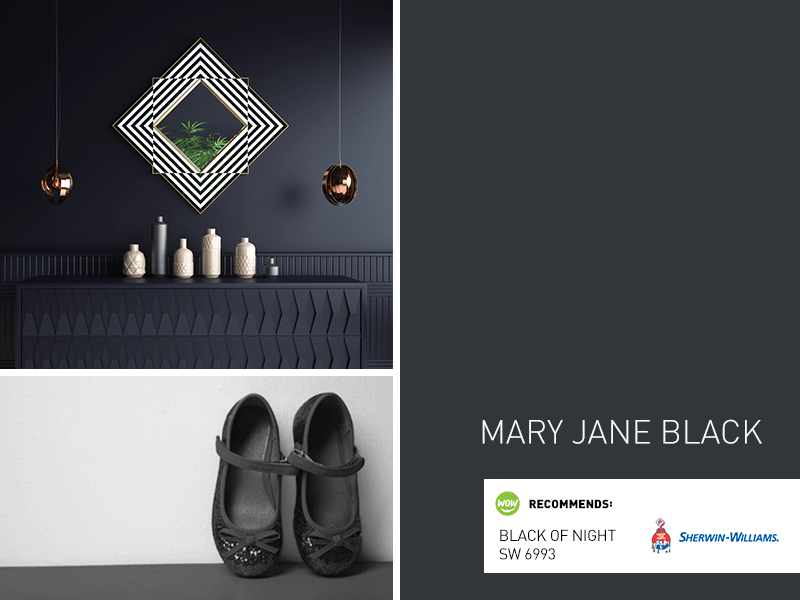 This color is inspired by the Dutch tradition of children leaving shoes out to receive treats from Sinterklaas. In North America, not everyone has the traditional wooden shoes, in which case those childhood mary janes will do! A classic color, seen from the first change of leaves to the end of the holiday season. 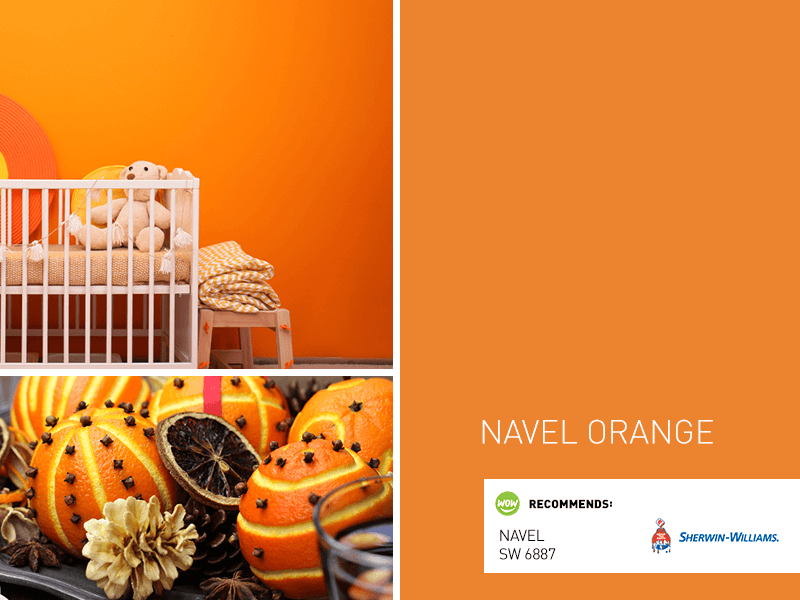 Navel orange can be woven throughout the holiday season. We see it everywhere from the first box of bright orange mandarins to the flicker of the fire on a winter evening. Navel orange brings warmth to a room, whether it’s the focus of the walls or the accent on pillows and decorative pieces. From the sparkle of Christmas lights to the shimmer of ornaments, and the bubble of champagne, soft gold is an effervescent hue that’s sure to show up throughout the season. It reminds us of the soft glow of traditional advent candles—as each candle is lit to mark the coming of Christmas, the room fills with that gorgeous soft glow. 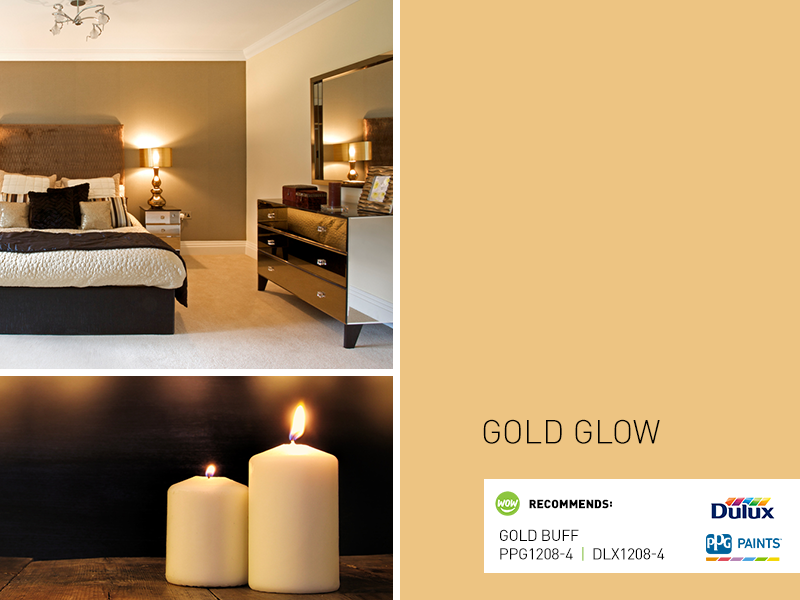 Soft gold pairs well with white accents and always adds a welcome glimmer to a room. Holiday baking is definitely at the top of our list of things to love about the holiday season! 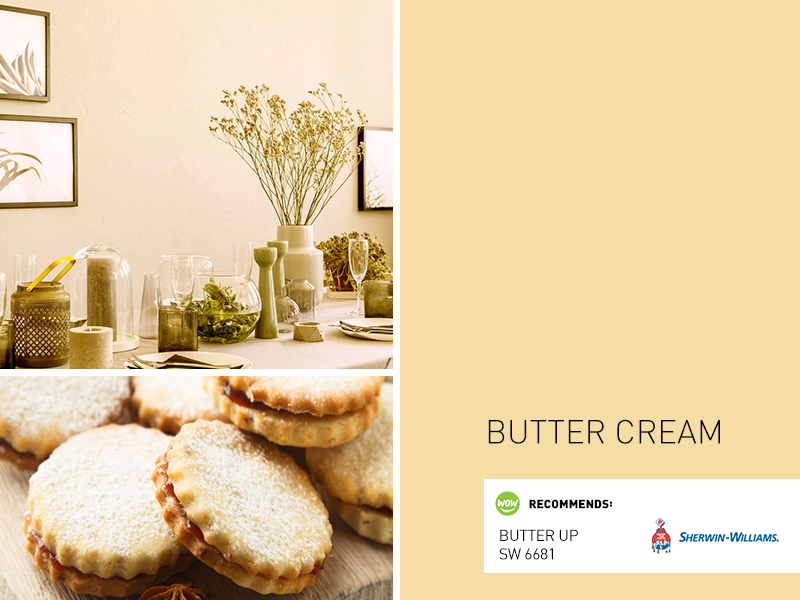 This color is a lovely pale yellow inspired by all those tasty holiday treats. Just looking at this shade reminds us of buttery shortbread cookies straight from the oven, filling the house with the sweet smell that we go running for. It brings warmth to a room without being too overpowering and pairs beautifully with the bolder colors featured in your decorations. 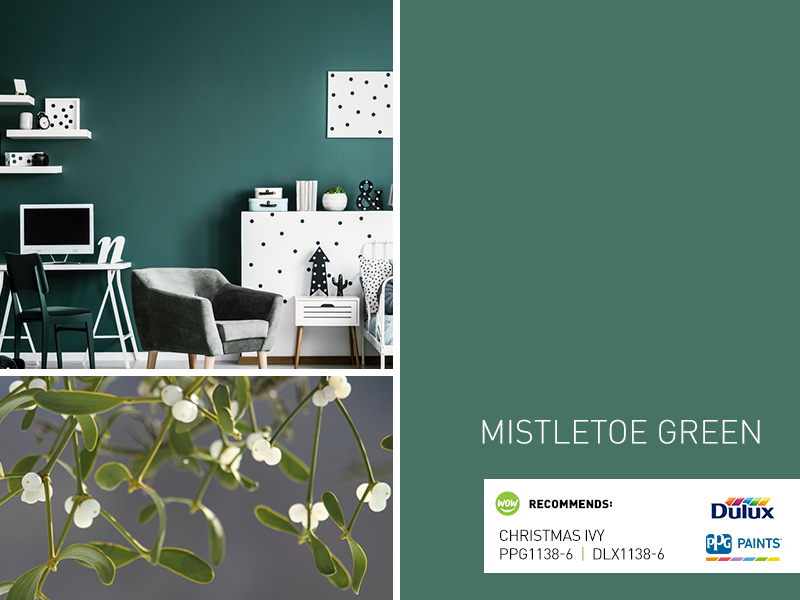 It wouldn’t be Christmas without a little bit of green and mistletoe is the perfect example. The bright green foliage brings the season to life and makes the kids skitter away at the thought of having to share a kiss with someone. It’s a bit lighter than the typical green of Christmas trees, which creates a bit of cool contrast. 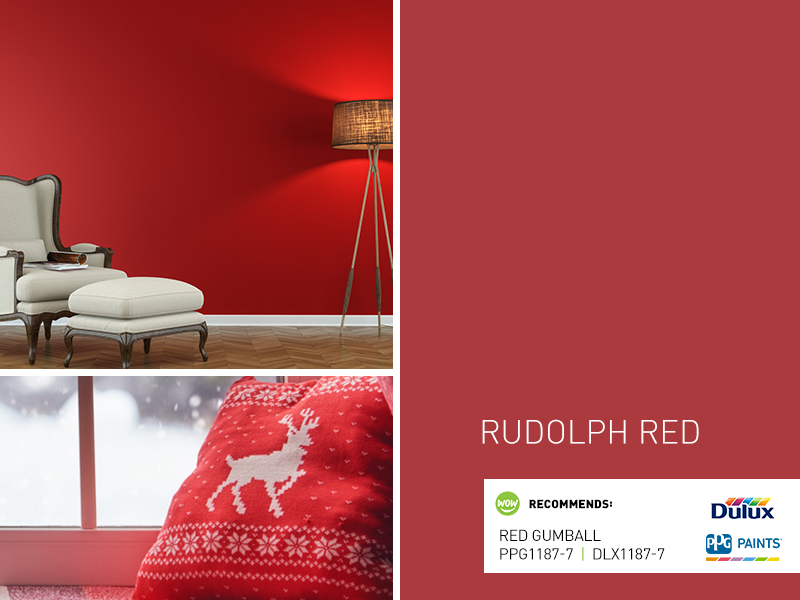 Add this festive hue into your space for a more modern take on holiday style. Everyone knows the story of Rudolph the Red Nosed Reindeer. That bright red hue is what the holidays are all about! We see this classic Christmas color sprinkled throughout the season from the changing leaves before winter begins, to the poinsettias and ornaments that we decorate with for the holidays. Red always makes a statement, however you decide to use it. 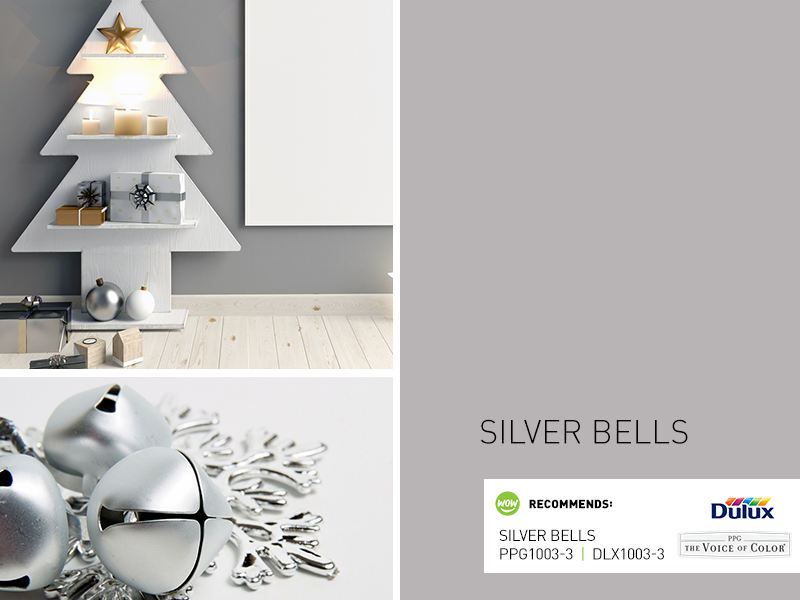 We love it paired with silver and white to evoke that traditional holiday glam look. 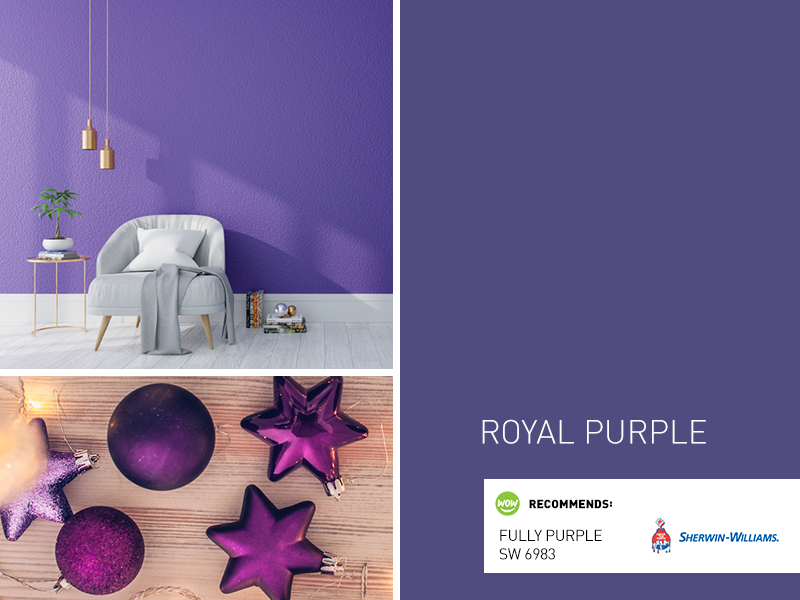 Purple may not be the first color that comes to mind when you think of the holidays, but it’s a fun way to switch things up! 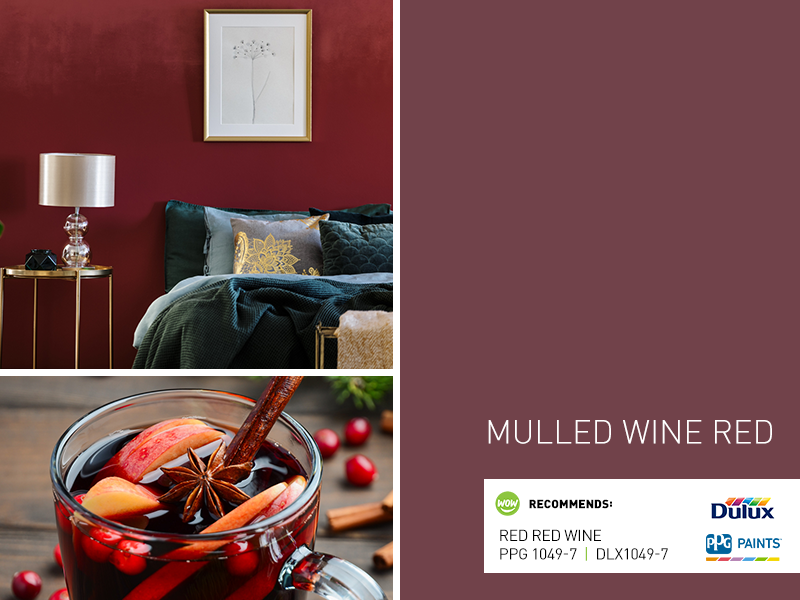 This rich, gorgeous shade gives your holiday space an edgy, modern twist. You’ll be totally won over once you see the contrast between the foliage of a wreath or tree against beautiful purple decorations. Try adding silver or white garland ribbon to finish the look. This is holiday glam at its finest. When you see this rich burgundy red hue, you can practically smell the fragrant spices simmering on the stove as you prepare mulled wine for your guests. It’s a bit more subdued than the bright red we tend to see in holiday decor and offers a sophisticated take on traditional Christmas looks. It pairs perfectly creamy whites or grays and looks perfect with shades of pink and even a pop of bright red! Snowy scenes are part of how we imagine the holiday season to look. A crisp white blanket of snow certainly looks gorgeous outside, but we think it’s nice to warm things up a touch when it comes to bringing that color indoors. 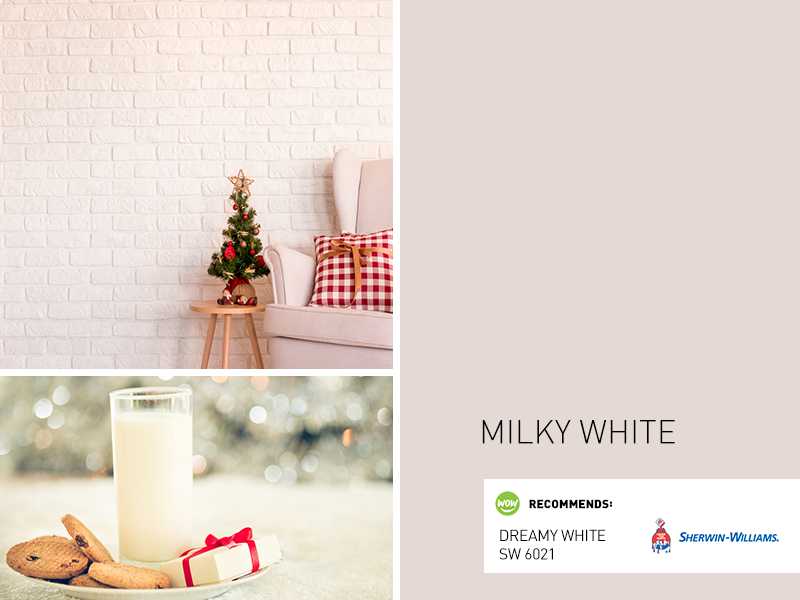 This milky white certainly has that festive feeling but feels much cozier than a bright snow white. We love it as an allover wall color, since it’s so easy to match with other colors. It’s sure to make the perfect backdrop for your holiday color palette. It seems like there’s always a bit more sparkle in the world during the holiday season. No color sparkles and shines quite like silver! What we love best about silver is its versatility—you can go for a shiny metallic silver or a matte silvery gray. Metallics work best as accents in furniture and decor, while a matte silver gray is a perfect neutral wall color that looks gorgeous all year long.